A Starý voják from a book of folktales. Mother always delighted telling us tales of Josef Stransky, her rascally Dědeček (grandfather) and his escapades. He served the required conscription of Austrian army service and then returned home to Bohemia with a friend from the war years. They roistered around, sowing their wild oats and engaging in all kinds of high-jinks that got them in trouble with village elder and authorities alike, pulling all kinds of pranks on the unsuspecting, but never getting into any major trouble, since it was all high spirits, rather than evil deeds. One of the pranks, (and I was never allowed to hear all the details), involved a wagon, a barn roof, a long timber and a donkey urged on with a hot poker, and created a lot of sniggering among the boys who heard the details and guffaws from the older uncles. Eventually, they settled down as farm workers and Dědeček’s buddy promptly engaged in a rather slow courting of an attractive young daughter of a prosperous farmer/landowner, newly widowed with two very young children. It seemed that this courtship might take years. This just wouldn’t do! Grandpa knew what was wrong. Gifts, tokens of fruit and sweet words were absent. Dedi coached his friend on pretty things to say and recite and each time he and his buddy visited the young widow, he brought baskets of plums, cherries, or peaches, which were poached from neighboring baronial estates! He brought flowers (also poached), ribbons and scarves. He left his friend with the lady and went out to play with the children, feeding them bonbons, carving them small whistles and making toy boats and inventing all kinds of games to keep them busy. Finally the lady told her shy suitor to not bother coming back and asked Dedi to speak for himself. They set the date and geared up to have a big village wedding. As was the usual practice, then, the groom was to be in top hat and tails and the bride in a lovely gown. Before the wedding ceremony (which was to be held before a nuptial mass) the bride and groom attended confession. After asking all kinds of questions about the sins that the Dědeček had committed in the war, (which had not been previously confessed, since Dedi was an indifferent church-goer) the Priest asked him if he and his bride-to-be had been sleeping together. Grandpa was horrified. “I’m not going to tell you that!” he exploded. “Fine!” replied the irrepressible Dědeček, clapping his hat back on his head and getting up off his knees, “If you won’t marry us, then I’ll march right out there and tell the whole village that you’re sleeping with my sister, your supposed housekeeper, and that niece and nephew of yours are really your children!” And away he went! The Priest squawked loudly and scuttled after him, grabbing Dedi’s long coat tails and hauling him to the back of the church. “Ego te absolvo!” he said and that was that! In later life, in times that my mother remembered, the Dědeček became the premier storyteller of the clan and the village. 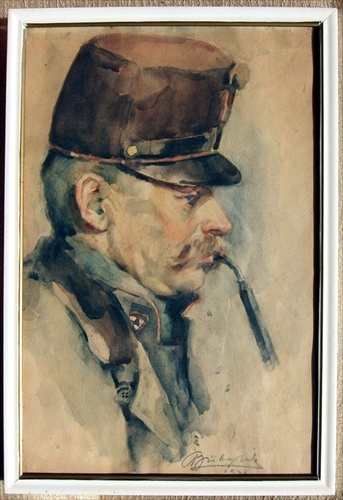 He was regarded as a true War Hero, and usually referred to as Starý voják, the “Old Soldier” because of an injury that he suffered that required him to wear a truss. In the evening he would hang it on the foot of the bed and the children would tiptoe in, regarding it with awe. Grandpa entranced the boys and girls with war stories, of his army buddy and their sly adventures defying the enemy, and slightly risqué versions of nursery rhymes. He was also the reader of the classics at feather-stripping sessions. He could hold groups of children and adults spellbound with his folktales, chilling or humorous by turns. He knew all the koledi (folksongs) and a great amount of family history and lore and was often found at the bedsides of the smallest children, telling stories or singing softly as they drifted off the sleep. No wonder he was a favorite! In his 108th year he was still walking around, although with the help of a cane, and still had some teeth. He finally passed away, peacefully in his sleep, after a large family party during the Christmas season, with food all day, horseback rides (yes, at 108!) dancing and music, where he had been the shining star of the entertainment. **Starý voják is a figure in Czech folktales.